Current Event round up is a milestone in the field of competition as the book addresses the core needs of competition aspirants appearing for the various tests. The book released four times in a year is quarterly general knowledge mirror summarizing the pith and substance of of latest developments in current general knowledge. Beginning from current scenario in national affairs the book elaborately deals with the subtle aspects and analysis of the knowledge applied to test the caliber of competitor wishing to enter the particular service domain in the government sector. As the saying goes aim at the sky but remain firmly grounded the international events round up section best tries to come true on the touchstone of the aforementioned principle by making provision of open window to enable the readers to peep clearly through the panorama of world affairs within minutes in one go. 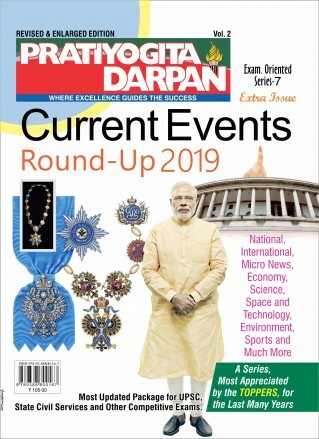 The micro news round-up is surely is our innovation as the section required a lot of brain storming to give rise to when we first launched the quarterly issue of current events round up in 2007. The title micro news round speaks volume of itself as how innovatively the bundle of news snippets take a full view of the personality -centric developments around us .it is as riveting as fascinating with a sort of nutshell approach. The graffiti in words as the section can best be put forth facilitates the fresh avenues for the students to brace for the mission laying ahead with intellectual zeal. Incorporating a battery of micro news in quintessential crispy package the variegated jottings on such subtitles as appointments, deaths, awards “n” honors, projects and schemes, persons in the news and important are a panoramic chronology of scattered short news items in focused manner. We will fall short of honest judgment if we falter to say few words on the last round up sections current knowledge capsules and current questionnaire – made in objective encyclopedia- to enable test takers to brush up and revise at the at last hour. It is an opportunity in objective format provided to them to revise what they have already grasped. The journey is endless with the indomitable spirit to conquer mountains of odds. We together with our beloved readers will reach the pinnacle of eternal success by inculcating sense of enduring hope and belief that will pervade the environment.